From sea to shining sea, the United States of America glistens with platinum ways to tour, taste, and stay! Did you know that every state in the Union has at least one winery? And most have many, many more! Come for a quick tour across the country to see what’s on our Platinum List. Boasting the only Four Diamond rating in Boise. A nicely appointed private bedroom suite with sitting room and balcony overlooking the vineyards. High tech and Wi-Fi friendly, but low stress in downtown Boise. A luxury hotel conveniently located in downtown Boise’s Spectrum Point shopping center. Offering full-service lodging in downtown Boise. A luxurious, completely restored historic hotel on a quiet Main Street in Upper Lake. A romantic wine lover’s paradise set among vineyards in the beautiful Red Hills AVA. A unique turn-of-the-century wine-themed casino located in Middletown. A charming family-owned resort on the shore of Blue Lakes in Upper Lake. Guest rooms are in one of nine railroad cabooses on the shore of Clear Lake. Provides boutique ambience, renaissance style, and easy access to the cable cars and Union Square. This newly renovated hotel sits within walking distance of the city’s finest designer stores. Part of the Joie de Vivre collection, this gracious hotel is located near Union Square. A tranquil retreat perched atop posh Nob Hill with an urban chic style and beautiful city skyline views. A boutique hotel in the heart of the Theater District and just steps from Union Square. Located on Fredericksburg Herb Farm, this sweet collection of 14 cottages provide the comforts of home in a garden setting with access to the spa and restaurant. This nicely appointed all-suite property has a main hotel, plus seven cozy creek-side suites. One of the town’s original momand- pop hotels with beautiful grounds just blocks from Main Street. A feed mill, a bunkhouse, and a loft-style silo are three options at this unique bed-and-breakfast. Located right on Main Street, this nicely refurbished hotel has a lovely swimming pool area. A 900-acre property with a hotel, condos, 54 holes of championship golf, and a host of amenities. A chic new hotel offering an urban edge in downtown Traverse City’s Waterhouse District. A Victorian-style hotel located on the West Grand Traverse Bay beach. A friendly bed-and-breakfast on the grounds of an Old Mission Peninsula winery. A gracious inn set on the grounds of a winery and equestrian ranch on the Leelanau Peninsula. There are delicious wine and food pairings at 23 wineries along the Leelanau Peninsula wine trail. 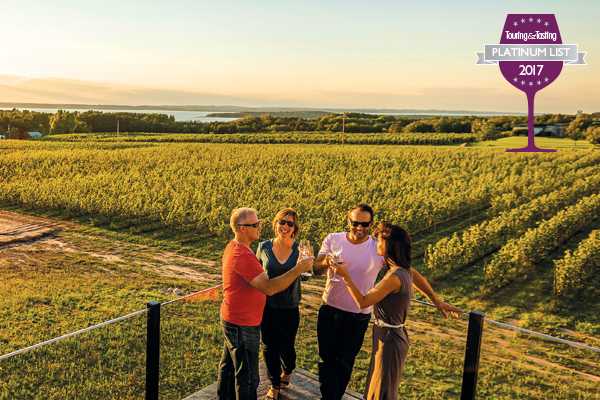 Visitors sample the new vintages and greet spring on the Old Mission Peninsula. This off-road running event features a two-person 10K relay and individual 10K, 25K, and 50K runs. There’s a magnificent collection of rare, restored antique wooden boats at Boatique Winery. The 1973 Austrian Pinzgauer provides a bumpy and memorable ride at this 4,300-acre ranch. In High Valley, Brassfield Estate Winery provides guests with a generous picnic after a tour and tasting. The former home of renowned actress, Lillie Langtry, is the site of a private reserve tasting. Public tours of this exciting facility are more like a guided conversation than a lecture. So what if it’s touristy to hop aboard—these are the world’s last manually operated cable cars. Admission is free and the interior of this magnificent civic center is amazing. For clam chowder, shopping, boat charters, and sea lion-watching this is the place to go. A 25-mile riverside foot and cycle path connecting parks, a public golf course, and hotels. More than 190 miles of expansive, interconnected trails just five minutes from the Greenbelt. Known for weekly giant paellas and other delicious Basque dishes, fun cooking classes, and more. About a half dozen urban-style wineries housed in old warehouses within an easy walk of each other. The self-guided walking tour maps of more than 80 points of historic interest are fascinating. Each two- to three-hour class is a flavorful journey into the Lone Star State’s culinary heritage. This pleasing town offers more than 150 unique shops plus a variety of tempting cuisine. More than two dozen wineries and tasting rooms are located in the area.